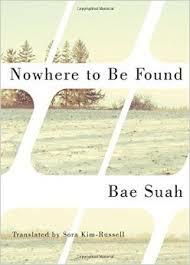 Bae Suah is a Korean writer who has attracted a lot of attention recently, surprisingly so for a writer who really hasn’t had a lot of her work translated into English so far (of course, this may just be the company I keep on Twitter and Facebook…). Last year, she was writer in residence at the Writer’s Centre attached to the University of East Anglia in Norwich, and she has another connection to UEA, having translated a couple of W.G. Sebald books into Korean. As mentioned, there haven’t been many opportunities so far for Anglophones to sample her work, but a couple of recent publications have changed that, two novellas which definitely have me eager to try more. The two pieces are courtesy of Amazon Crossing, both translated by Sora Kim-Russell. The first is an upcoming release, Nowhere to Be Found, a novella about a young woman trapped in a depressing family environment; the second is a shorter story which was released last year, Highway with Green Apples, one in which the protagonist has managed to shrug off some of the shackles around her. They’re both excellent stories and make for a great introduction to Bae’s work. In Nowhere to be Found (review copy received through NetGalley), we see a young woman supporting her poor family through short-term, badly paid jobs. Her mother is an alcoholic, her elder brother a labourer scratching around for the next shift, and her younger sister is trying to get through school as best she can. Twenty-four and exhausted, the elder sister is caught in a situation she can’t get out of, and the reappearance of Cheolsu, a young man she knows from her school days might not be the break she was expecting. It’s a scene that rocks the reader, a bolt from the blue – and it only really makes sense towards the end of the story. When life is closing you in, it’s up to you to find your own release, no matter how dark others might find it. 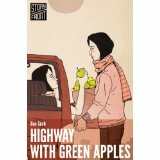 Highway with Green Apples is another story of a twenty-something, with a woman about to turn twenty five taking a road trip with a boyfriend, a man who is very soon to move on from her. The woman has run away from her family, sick of being the dutiful daughter and sister, but having escaped domestic drudgery, she’s not sure what’s supposed to happen next. I’ve read a lot of books which focus on Korean families, but many concentrate on the father or (more often) the mother. This one looks at things from the view of the daughter, the dogsbody for the rest of the family, pushed around by a lazy brother and a resentful mother. In the frustration of the home environment, people react in different ways, and the choices people make lead them to very different futures. One aspect of Highway with Green Apples I loved was the structure of the story, with a mix of time strands taking the reader back and forth in time, but gently, with the various scenes almost melting into one another. There’s a strong focus on memories and nostalgia, with some beautiful descriptive writing evoking the times described: the smell of the apples bringing back the road trip; the snowy impromptu get-together in the dark; the childhood photo on a hot day, blinding light, heat and sweat. There are hints here of (dare I say it?) Murakami at his simplest and most evocative in these scenes. These two stories make a nice start, but this is a writer who has been working for twenty years (Highway with Green Apples came out in 1995, and Nowhere to Be Found appeared three years later). In 2001, Bae moved to Germany to learn the language and broaden her horizons, and she is now a Sebald Translator. I suspect that her more recent work might be a little more sophisticated, and it’s frustrating that there isn’t the opportunity to find that out at the moment. I wonder how they decide which works to translate – and why they choose the very earliest books by an author. Marina Sofia – Not being inside the world of publishing and translation, it’s a bit of a mystery to me – although some people complain when it happens the other way, too, and it’s the latest book which gets translated first! If it’s part of a series, then yes, I complain too when it’s translated out of order! Not so much with standalones.